That said, a short story about why you might want to go. 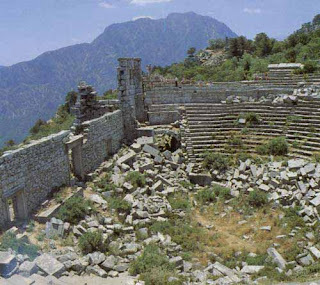 In 2006, my wife and I were honeymooning in the Antalya region, on the Mediterranean coastal plain of south-central Turkey, what was the ancient territory of Pamphylia. 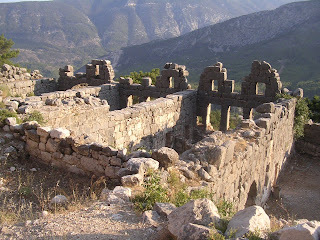 Borrowing a car from a friend’s brother, we headed up to a site that we’d never seen, the ancient city of Termessos. In recent years it has become a national park, but in ancient times it was a formidable city/citadel, one which Alexander the Great himself was unwilling to spend the time and energy to conquer. After a short but invigorating climb, we found ourselves on top of a mountain and nearly alone in a vast Greco-Roman metropolis. It was one of the most romantic places I’ve ever been. Most of the buildings, including a gorgeous theater, are still in place and largely intact, tucked amid the creeping vines and trees. We felt like 19th-century explorers as we wandered across the city, discovering the fading inscriptions, broken columns, ancient tombs, each turn of the winding pathways providing us with new and delightful vistas. Best of all was the complete absence of noise, of hawkers, of the modern world intruding upon our experience.